Bulgarian club Cherno More Varna’s 4-0 defeat in the domestic championship on Sunday sparked a Hollywood-style highway chase, a midnight crisis meeting and the sacking of three players. Cherno More fans were so disgusted by their team’s performance against Black Sea rivals Kaliakra that they set up a road blockade on the 64-km trip back to Varna. The club bus, escorted by police, faced some 200 angry supporters chanting for change when it reached Cherno More’s stadium. 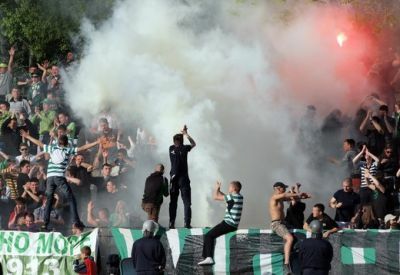 Frustrated fans insulted the players as they entered the stadium to meet the owners while Cherno More ultras attacked the bus with stones and bottles, smashing the windscreen. “After another embarrassing defeat this season, the management of Cherno More decided to part company with Yodan Yurukov, Nikolay Domakinov and Milen Petkov,” the club said in a statement following the crisis meeting. Midfielders Yurukov and Petkov and defender Domakinov are former internationals and were among the most experienced players in the team. Cherno More, Bulgarian Cup finalists twice in the last five years, are ninth in the standings, 13 points behind leaders Litex Lovech.